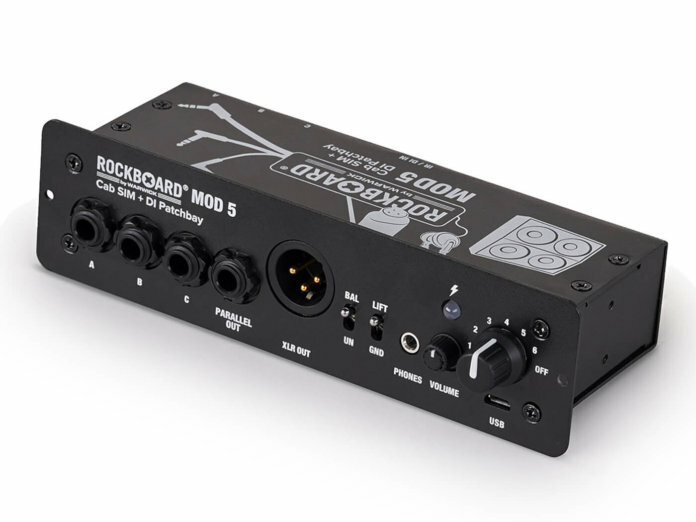 RockBoard has released the MOD 5, an all-in-one cab sim, patch bay and DI box that fits snugly into the brand’s larger-framed pedalboards. A key feature of this compact device is its six selectable IR speaker sims intended for both guitar and bass. They’re not limited to just half a dozen sims – the MOD 5 supports up to 1,024 user-generated IRs that can be ported in via micro USB. The MOD 5 also boasts an active DI, which lets you send your pedalboard’s signal directly to front-of-house. As a patch bay with three ins/outs, a parallel out and an XLR out, the MOD 5 can also act as the hub of your effects setup. It’s designed to route connections from below your ’board to the front, giving you “a central access point to your setup and tidy up your connections”, according to RockBoard. Rounding out the MOD 5’s features is a headphone amplifier – with adjustable output volume – that lets you practice silently. Available from May at €179. More info at rockboard.de.